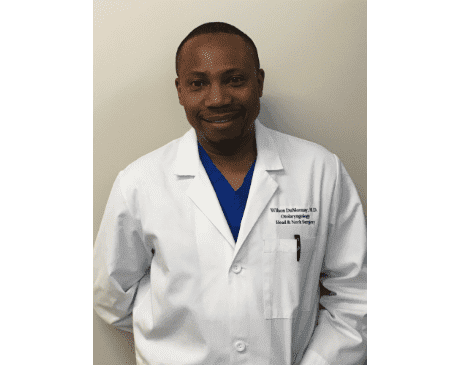 Wilson DuMornay, MD is a board-certified ENT surgeon specializing in diagnosing and treating the full scope of illnesses, diseases, and injuries that affect the ear, nose, and throat. At his practice, Broward ENT Services in Fort Lauderdale, Florida, Dr. DuMornay welcomes children and adults, where he treats each patient with compassion, fully explains their condition and treatment options, and develops customized care that meets their unique needs. After graduating with honors from Temple University School of Medicine in Philadelphia, Pennsylvania, Dr. DuMornay completed general surgery training at Tulane Medical Center at the famous Charity Hospital in New Orleans. He returned to his hometown of New York City for training in Otolaryngology-Head and Neck Surgery at Albert Einstein University at Montefiore Medical Center. From there, he continued his training at the world renowned Memorial Sloan Kettering Cancer Center. With a passion for learning, Dr. DuMornay pursued fellowship training at the University of Miami for Head and Neck Oncology with Microvascular Reconstruction. After his fellowship, he served in the United States Army as a surgeon on a trauma team in Iraq. During this time, he provided care to soldiers injured in combat as well as Iraqi patients in Baghdad and surrounding villages. He was deployed two more times before leaving the military with the rank of Lieutenant Colonel. Dr. DuMornay has a distinguished career practicing otolaryngology medicine in South Florida, where he’s affiliated with Broward Health North and Broward Health Medical Center. He has proudly received numerous awards, including the Patient’s Choice Award in 2014 and the Compassionate Doctor Recognition Award in 2016. Recognized for his expertise in head and neck surgery, Dr. DuMornay often receives referrals from other doctors who trust him to care for their patients. At Broward ENT Services, Dr. DuMornay finds the right course of treatment for each unique patient and uses minimally invasive therapies whenever possible.